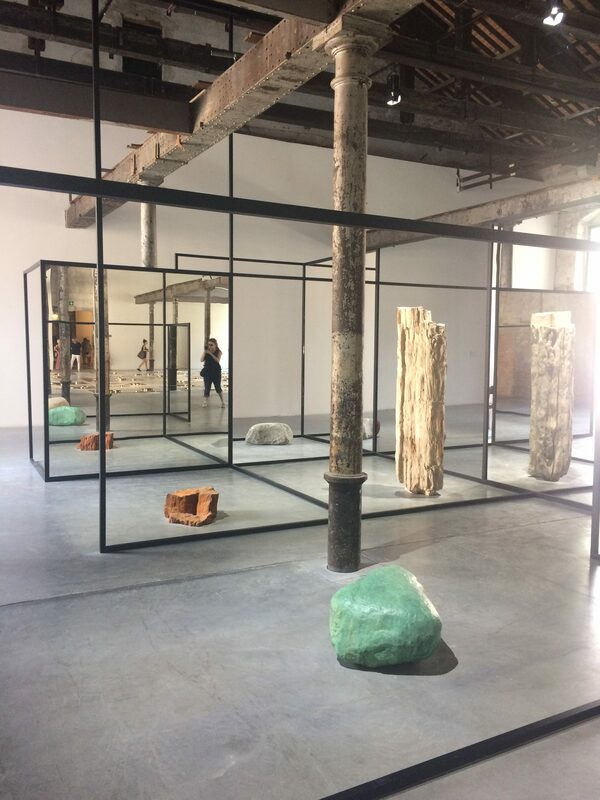 These images were taken during the summer of 2017 when I attended the Biennale in Venice on an exhibition in the main pavilion section, “Viva Arte Viva,” of the Biennale. 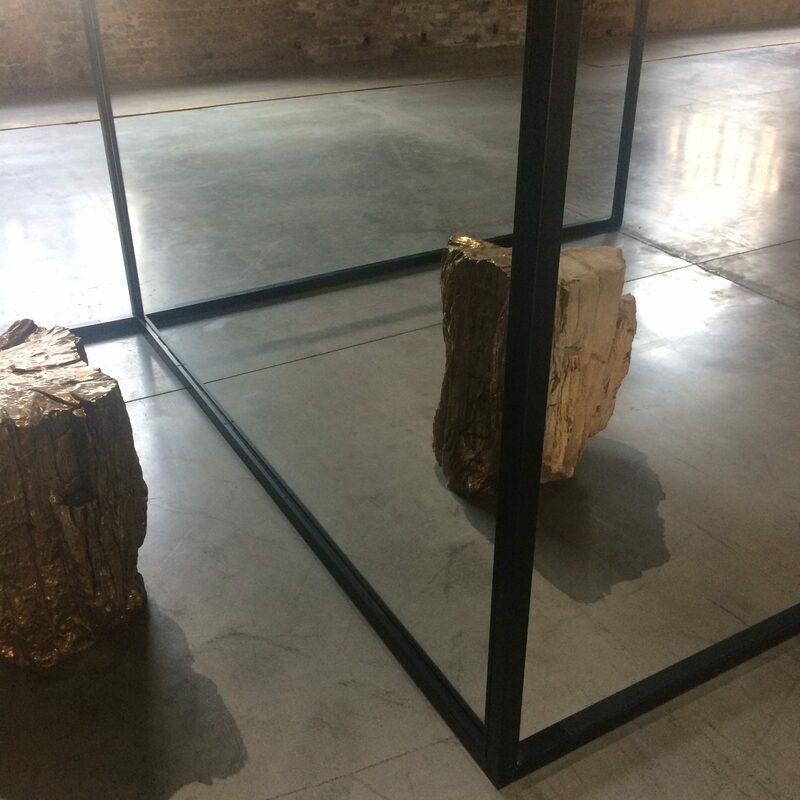 This exhibit – WeltenLinie (One in a Time) – by Alicja Kwade uses powder-coated steel, mirror, stone, bronze, aluminum, wood, and petrified wood. The objects are placed on either side of mirrors so that as the viewer walks past, the actual object is replaced by the reflection of another, perfectly lining up as the viewer moves past to create the illusion of a whole object, except with different materials making up each the reflected and actual objects. This exhibit relies on symmetry and angles of reflection to create the perfect alignment that leads to one object being replaced by the reflection of another as the viewer walks past. Therefore, as the viewer moves, the angle of reflection and the amount of each object that the viewer is seeing changes. The diagram below shows an example of an angle where the viewer sees approximately half of the “real” object and approximately half of the reflected object. 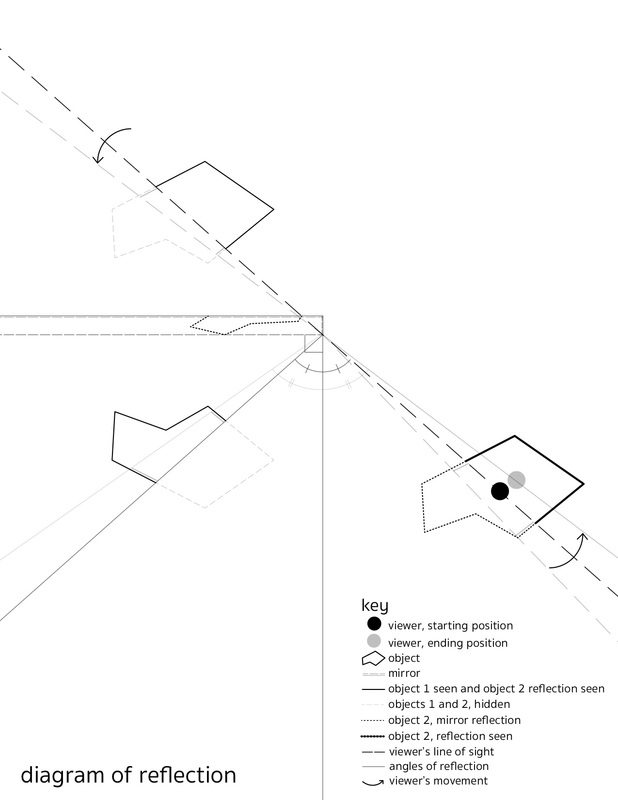 The arrows indicate the viewer’s motion and the resulting change in these angle relationships and what the viewer then sees after this movement. As the viewer moves to the right, he or she sees more of the original object and less of the reflected object. The lighter lines in this diagram generally reflect the result of that movement. Note that this diagram shows a view from above to highlight the angle lines. However, the objects will be viewed from a side view, not from above, in order to be actually reflected. Therefore, there is some error in how these objects are being represented in this diagram. The mathematics behind this exhibit include issues of symmetry and angles of incidence and reflection with the mirror. The angle of incidence is the angle between the perpendicular line intersecting the mirror and the line between the object being reflected and the mirror. The angle of reflection is the angle between the perpendicular line intersecting the mirror and the line between the viewer and the mirror. These two angles are labeled in the above diagram. These angles must be equal because of the physical properties of a mirror and how light is reflected off of mirrored surfaces. Therefore, as the viewer moves to the left, these angles increase (also shown in the above diagram with the lighter lines). Below is a specific example of how the angles of reflection and incidence line up in this exhibit. The viewer is located at point C and the mirror is line f. Poly1 is the object being seen directly by the viewer. Poly2 is the object being reflected then seen by the viewer. And Poly3 indicates the combination of Poly1 and Poly2 which the viewer is seeing. The viewer is only seeing half of Poly1 – the DGF half – which corresponds to the ONM half of Poly3. The other half of the final object the viewer is seeing is the HKJ half of Poly2, which is being reflected in the mirror. The lines from Poly2 to the mirror indicate the reflection and the angle created between these lines and the perpendicular to the mirror are the angles of incidence. In this case, the angles are 45º. 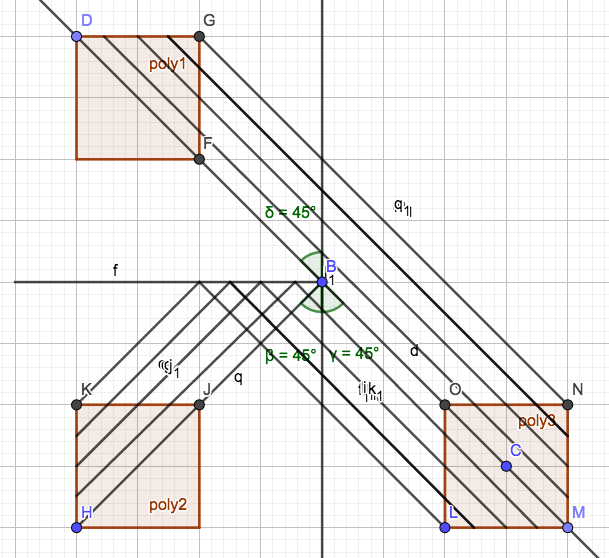 The resulting lines from the mirror (line f) to Poly3 indicate the resulting reflection. These lines along with the perpendicular to the mirror form the angles of reflection, which are also 45º. 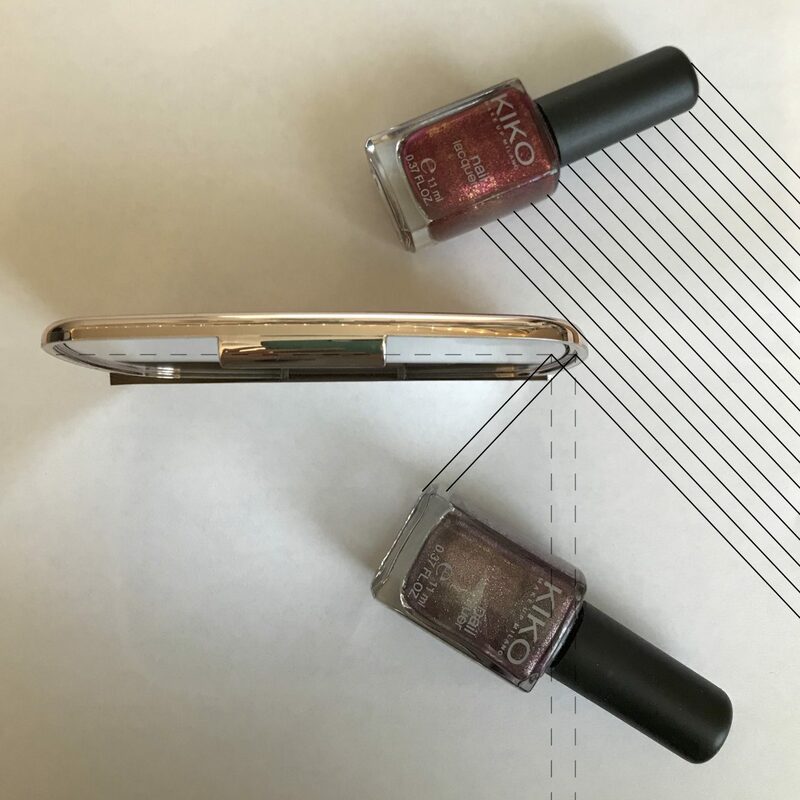 The key to ensuring this alignment and perfect reflection is that the two objects must be perfectly lined up on either side of the mirror. Additionally, the one in front of the mirror (whose reflection will be seen by the viewer) must be a mirror image of the opposing object so that when reflected, the two objects align. This is easier to see in the original diagram above because the objects are not squares (as they are in the second diagram). The mathematics described above enables the playfulness of this exhibition because the alignment of the objects and the mirror nature of them must be perfect in order to trick the viewer into seeing a single object created by a reflection and an actual object. In this sense, the math enriches the exhibit because, while it is not overt to the viewer (the angles aren’t labeled, the physics involved isn’t described in the exhibit, etc. ), it is by necessity present in the exhibit due to the nature of mirrors, light reflection, and the creation of pairs of objects that are mirror images of each other. This exhibit made me wonder what would be needed to recreate this effect. Additionally, I wanted to try having lettering on the objects. 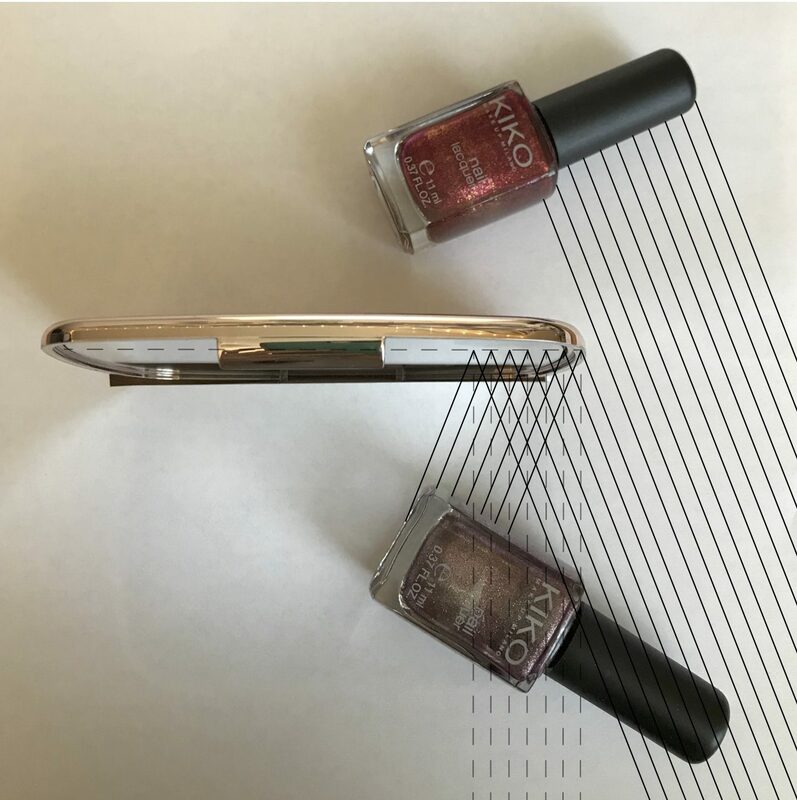 I did a simple recreation the setup using a makeup mirror and two identical bottles of nail polish containing different colors of nail polish to distinguish them from each other in the final image. The image below shows this setup, with lines showing the reflection of the purple bottle and the direct viewing of the red bottle by a viewer to the right. The dotted lines represent the mirror and the perpendicular lines to the mirror line, showing the equality between the angle of incidence and the angle of reflection. The image below shows this reflection from the viewer’s perspective. As you can see, only the end of the purple bottle is visible, with the majority of the red bottle being seen directly by the viewer. As the location of the viewer changes, the ratio of the amount of purple versus red bottle changes. As seen below, the viewer is now further to the left and more of the purple bottle is visible through the reflection. The image below tries to demonstrate this change in perspective. The angle is not quite the same as the above image but there is a noticeable difference between the first instance of the aerial view and this one. The angle of reflection and incidence has changed with the changed location of the viewer (who has moved to the left). Finally, lettering on the object being reflected would have to be printed in the mirror image, so that when it is reflected, it is legible and lines up with the object being seen directly. 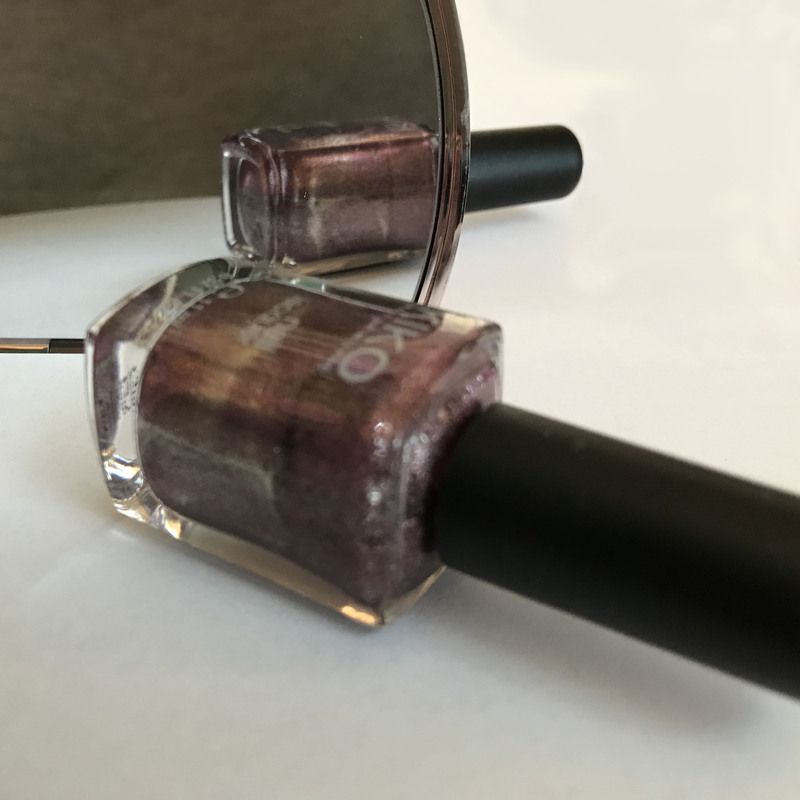 In experiments with the nail polish bottles, the lettering did not line up between the reflected object and the direct object. The mirror flipped the letters. 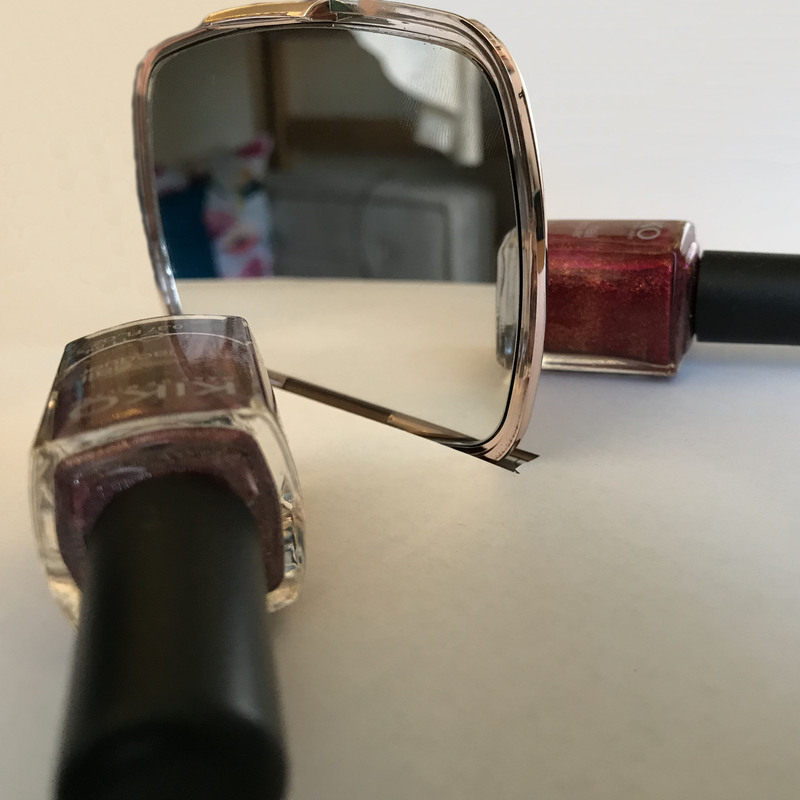 Therefore, in order for this to be perfect, the lettering on the bottle being seen in the mirror reflection would have to be printed as the mirror image of the original lettering. Only then would the bottles and lettering line up between the reflected and direct objects. Ultimately, it was relatively easy to recreate a simple setup of the original exhibit by Alicja Kwade. The beauty of the exhibit comes from the forms chosen and the clean setup of the objects and mirrors. When first seeing the exhibit, it is not obvious to the viewer that the reflection trick will occur as he or she walks around the exhibit. This is discovered as the viewer explores, drawing the viewer’s attention to the objects, reflections, and, indirectly, to the mathematics behind this alignment. 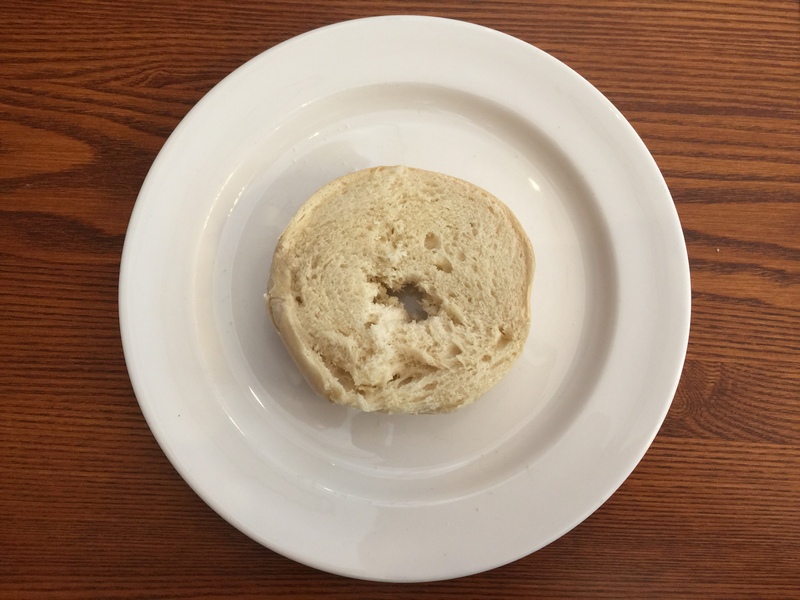 The inspiration for this blog post is a plain breakfast bagel, as pictured below in this photo taken in Winthrop Dining Hall on a Sunday morning. The bagel closely resembles a shape very important in the topics of geometry and topology in mathematics–that is, the torus. Tori can live in any n-dimensional space for n>2, but because humans view bagels in 3-D, this discussion will center around the torus constructed in 3-dimensional space. 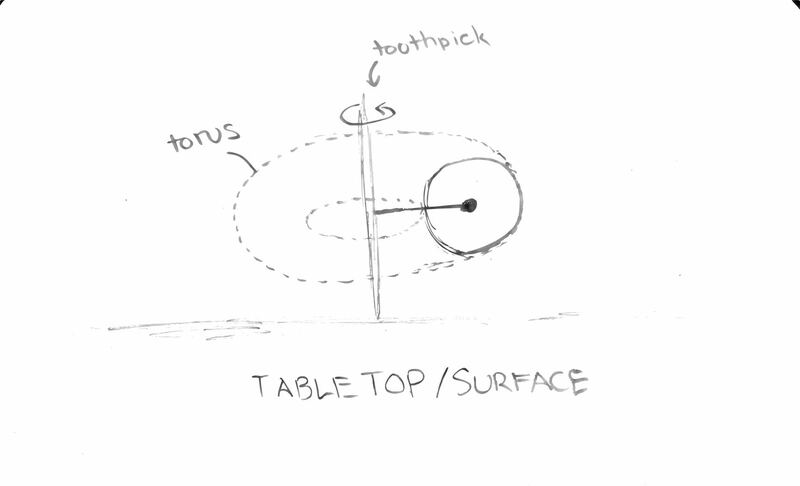 Consider a toothpick held vertically against a tabletop. This will be our axis of rotation. For a circle drawn on the same plane as the line passing through the toothpick, the surface created by spinning the toothpick 360 degrees forms the entire torus. However, bagels are not hollow. Therefore, the rest of this discussion will focus on the solid torus, whose surface is an ordinary torus like the one visualized in the steps above, but also includes all of the points trapped within the torus. 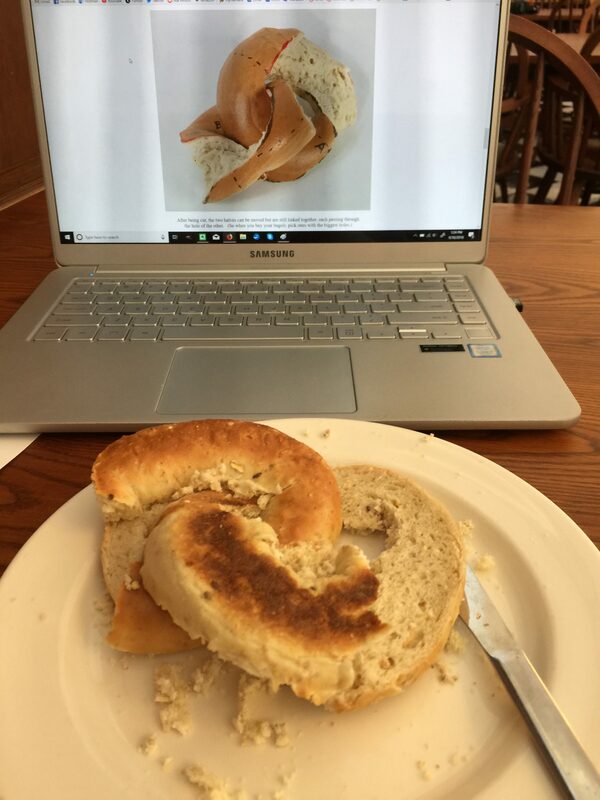 Even acknowledging that real bagels are imperfect and therefore only closely approximates the solid torus, we see that this seemingly mundane and rather plain breakfast item becomes a foundational example in the field of topology! If you enjoy your morning bagel with cream cheese, then some interesting mathematics might come into play: How should I slice my bagel so that I can have more space to spread cream cheese? Typically, the bagel is sliced horizontally to create two halves on which to spread cream cheese. Let us say we will limit the slicing to one connected motion of a knife. 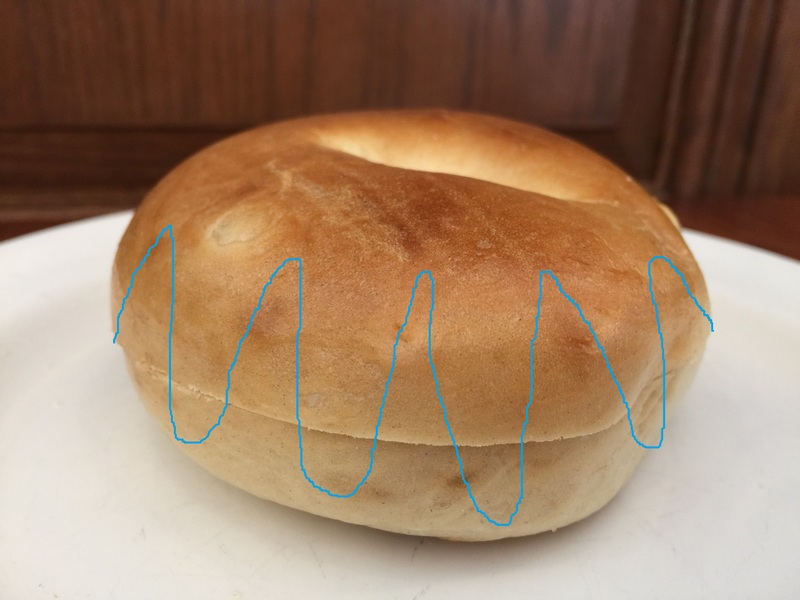 What if we slice using a cut shaped like a sine wave all around the bagel? Surely that would give more surface area of exposed white bread for cream cheese. Expanding this to an extreme case, what if we keep increasing the frequency of this sine wave so that we have a near-infinite number of ridges on which to spread my cream cheese? Continuing this logic, in theory there is no limit to the amount of surface area we can generate with the cut. Therefore this question becomes difficult to answer. Perhaps the best way to maximize the surface area of exposed bagel is to just cut as many ridges as physically possible with my knife along the side of my bagel, where the limit of how thin we can slice is only physical reality. In 2012, Professor George W. Hart published an article about an activity he introduced to his students at Stony Brook University in which they were challenged with slicing a bagel into congruent, interlocking halves in one cut. If you want to give this puzzle a shot, then put a hold on reading this blog post and find yourself a bagel and a knife. 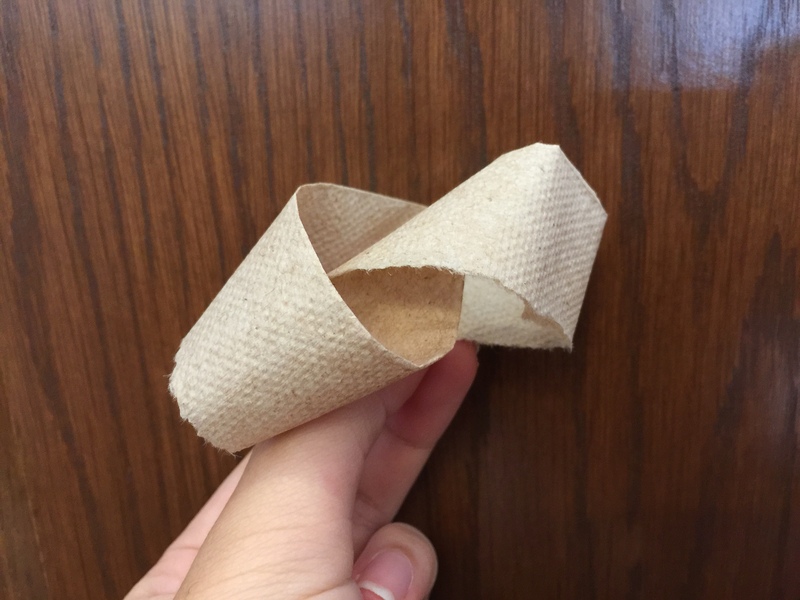 *One great way to visualize a two-twist Mobius Strip is to take a strip of paper, turn one end around twice while holding the other still, and gluing the two ends together. I bring this up because Professor Hart’s challenge to his students is a fun and engaging activity that draws the attention of people who may never have even heard of tori and mobius strips. The idea of a single cut that splits one ring into two interlocking ones is exciting, and for that reason I will use this specific cut as an example in the exploration of surface area. Does this cut increase the amount of exposed bagel on which I can spread cream cheese? While this is surely not the most time-efficient method of cutting a bagel, we can use mathematics to test whether or not such a cut would actually give us more space on which we can slather our tasty cream cheese. 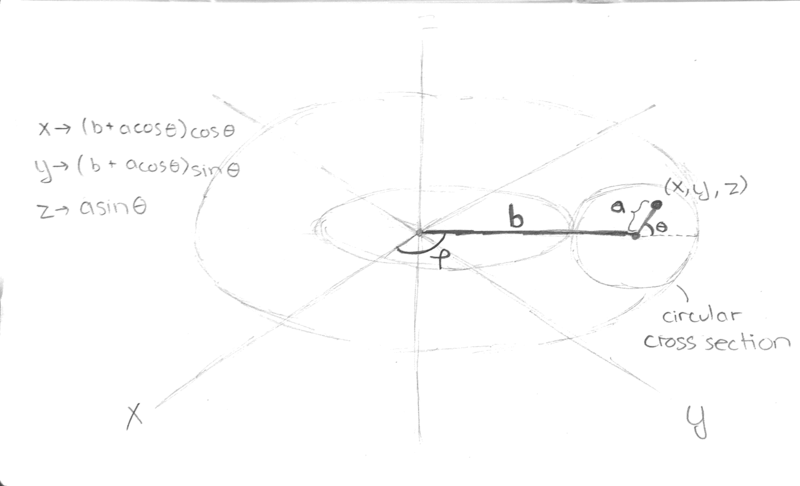 The parametrization is (x,y,z) = P(a, θ,ϕ)=((acosθ+b)cosϕ, (acosθ+b)sinϕ, asinθ), where a is the distance of the point from the center of the circle that we rotate and b is the distance of the center of that circle to the center of the torus (which our toothpick passes through). The value θ tells us the angle between the segment connecting the point (x,y,z) and the center of the circle, and ϕ tells us how far we’ve rotated the toothpick (in other words, which disk cross section). 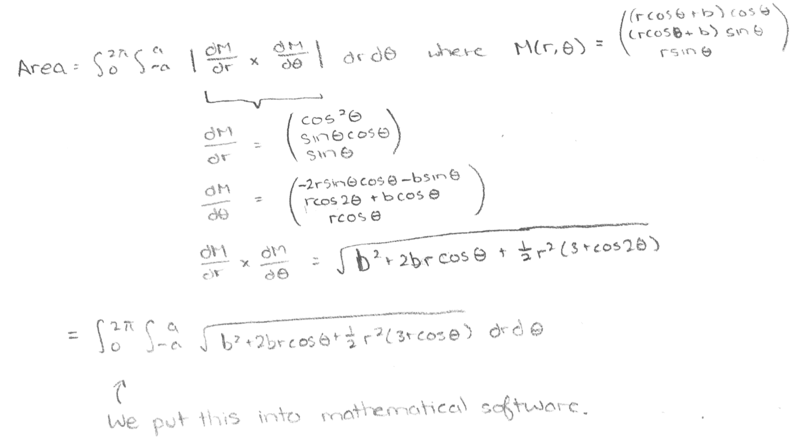 (x,y,z) = M(r, θ) = ((rcosθ+b)cosθ, (rcosθ+b)sinθ, rsinθ) where a varies from -a to a and θ varies from 0 to 2π. After this, we will use a formula for finding the area of a parametrized surface, and we will find that the integral is quite the monster. (For a more thorough explanation of the calculus behind parametrizing a mobius strip and calculating surface area, see https://www.mathstat.dal.ca/~antoniov/bagelrings.html). 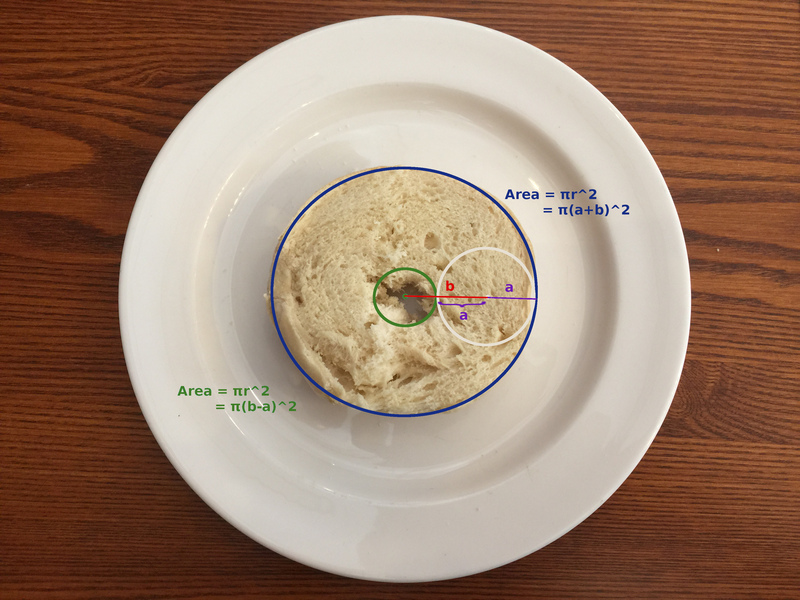 The surface area of a straight cut through the center of bagel is more straightforward. If you’ve ever split open a bagel the normal way, you’ll likely have noticed that the exposed bagel is simply a circle with a hole in the middle. Therefore, we can find this surface area just by taking the area of the outer circle (π(a+b)^2) and subtracting the area of the smaller circle (π(a-b)^2). Comparing the two areas using mathematical software, we find that the ratio of the surface area of the mobius cut to the surface area of the flat cut only changes when we change the ratio between a and b. Additionally, that ratio of surface areas is always greater than 1, so we can guarantee that the mobius strip will always give more surface area! 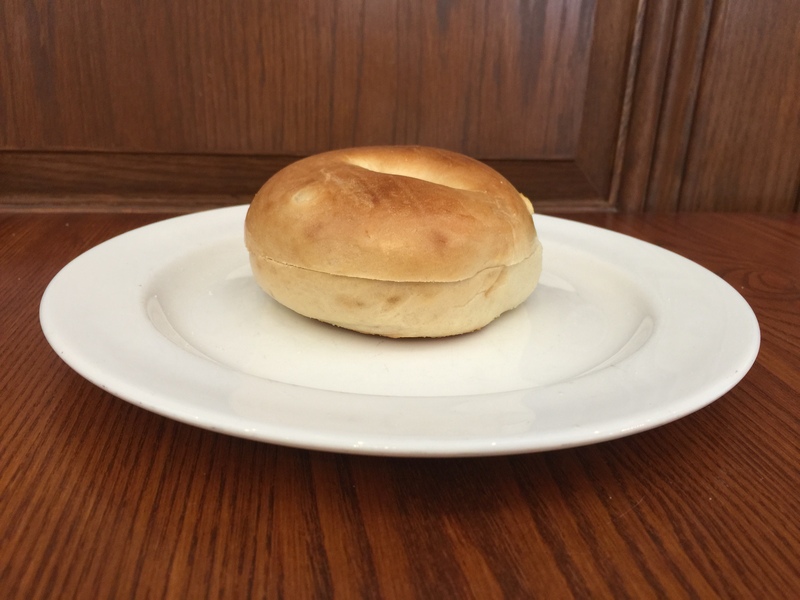 However, the question of how much additional “bagelscape” we have for our cream cheese is dependent on the characteristics of the bagel shape. The greater a is in comparison to b, the greater the ratio of surface areas. That is, the fatter the bagel and the smaller the hole, the more benefit we get out of cutting our bagel using the mobius strip! 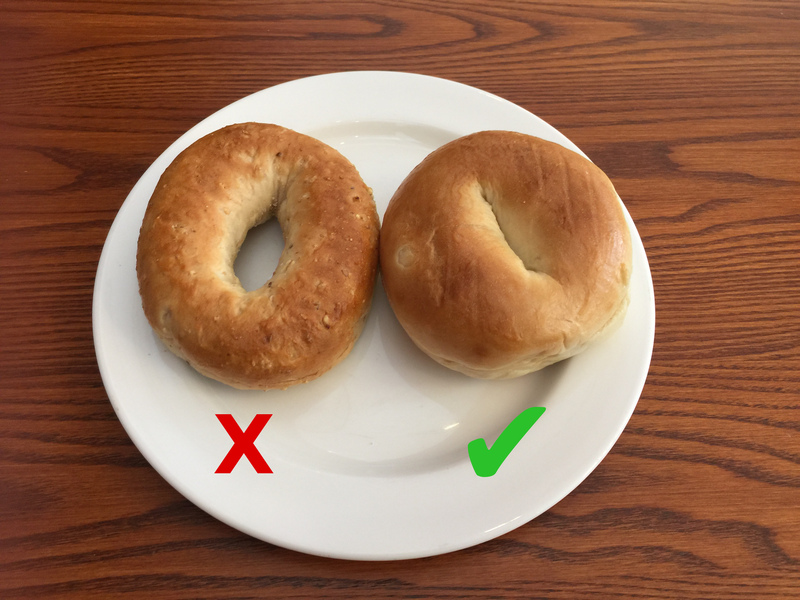 In theory, the shape of the bagel on the left will give less significant gains in surface area from using a mobius cut while the shape of the one on the right will give more gains out of using a mobius cut. Therefore, referring to our previous diagram of the torus, the Mobius cut will only work for a<b/2, in which case the surface area gain is sadly only about 5% from our mathematical software analysis.